Conference Recording for conventions & meetings nationwide! How We Provide our Conference Recording Service! MBS provides conference Audio & Video recording and on-site cd audio, Mp3 & Mp4, and Online Subscription service at conventions & meetings nationwide. The CD Audio product provides conference recordings of sessions minutes after they conclude. Yes, we still provide audio CDs. Cars are still manufactured with Compact Disc, so therefore we believe the CD media still plays an active part in the behavioral process of users. We also offer the conference on USB Thumb drive. 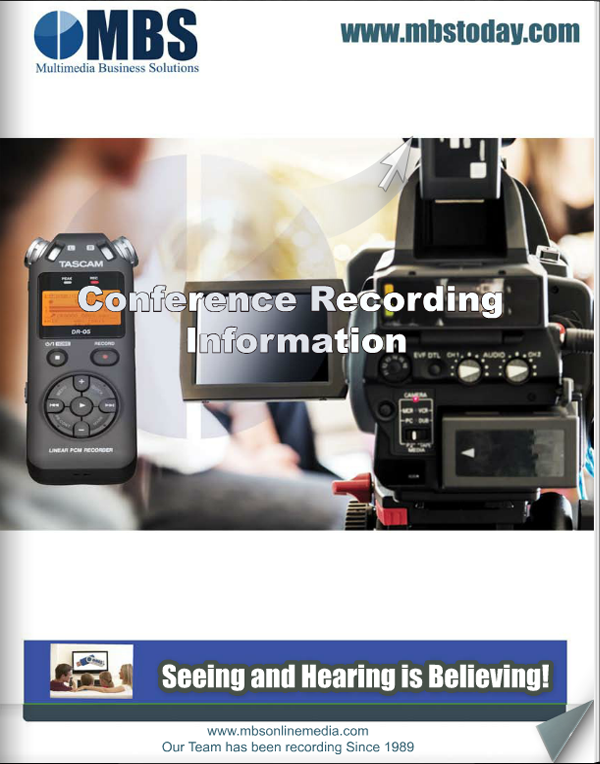 This product contains all recorded audio along with available visual slides.Bottom line, the recordings can reinforce what you heard or missed. They are the live presentations heard earlier, not prerecorded, typically! In most cases, we rely 100% on the sales to your members.If the past sales are not available, a guarantee of sales will be needed. The on-site guarantee is for recordings sold on-site, during the conference. After the guarantee is reached, on-site or post-conference, a royalty payable to the association or sponsoring organization, is provided. The audio/Video or online download price average is $10.00 – $15.00 up to 80 minutes in length. The average USB Tool cost is determine pre-conference when the audio order form is completed but usually around $159.00 to $299.00. MBS will provide the two complimentary audio sets or login access to the organization. We brand all recordings from YOUR brand with labels, insert (for the storage case albums) & onsite order form customized to your association. This is our standard service! When you need quality recordings of your conference, seminar or convention, be sure to call MBStoday.com at Toll free 1-855-224-2537 ext 103. If you would like more information to se if MBS is a good fit for your organization, please continue to fill out the form or better yet call.